Politically-correct publishers are censoring children's books because of fears over health and safety, according to a leading author. Lindsey Gardiner, who has written and illustrated 15 children's books, claims publishers banned youngsters from walking alone in one novel and removed sharp objects from another. 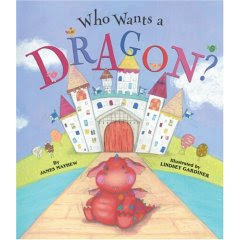 Her latest book, Who Wants A Dragon?, originally featured a dragon toasting marshmallows on flames from his nostrils as he sat around a campfire. She said her publishers insisted that she change the scene because "it looks dangerous and goes against health and safety". Miss Gardiner, 36, who is based in Dundee, said: "It does seem to be worse in the UK, more than anywhere else. I have never had a hassle having things changed in places like Japan." She complained that the requests have no consistency and added: "I have seen others kids' books that have dragons breathing fire." Another of her novels, When Poppy and Max Grow Up, initially included a scene where a little boy climbed a ladder, but that too was changed. "They didn't allow Max to be on a ladder because they thought it was precarious. But when I changed it, I had him standing on a pile of three paint cans, which is much more dangerous, and they didn't have a problem with that," she said. "There is also a cooker in the story and I had one of the elements glowing red, because the cooker was switched on. But they didn't allow that either, and I had to change it to green." The "crazy" changes did not fool their intended audience, she said. "When I go to book signings, I sometimes take with me some colouring-in pictures, and the kids draw the elements as red because it is on and it's hot. They are not stupid," she added. Nicola Morgan, an award-winning children's author who has written more than 80 books, agreed that pressure was being placed on writers to remove dangerous items from their work. Miss Morgan, from Edinburgh, said: "In one recent story I did, I was allowed fire, alcohol, drowning and a chicken-eating python, but the one thing I didn't get past the editor was a scene with a Ouija board. "Children need to learn the dangers of fire and alcohol and of drowning, but the fear surrounding the Ouija board was that kids might not know what it is and go and try it." She said she thought editors were worried that parents might complain and wanted to "cover their backs". The Society of Children's Book Writers and Illustrators warned against censoring young people's fiction. A spokesman said: "Honest literature opens communication and gives young people the opportunity to test their values and make positive choices for their lives."